For academic clinicians: A physician who spends more than 25% of his/her time on research (e.g. several R01 grants) or administration (e.g. division head, director of critical care) is not eligible. Recognized by patients and families as a caring and dedicated healthcare provider and by his/her peers as having made substantial contributions to the clinical care of patients with respiratory disease. Nominations must reflect excellence in this area above all else. 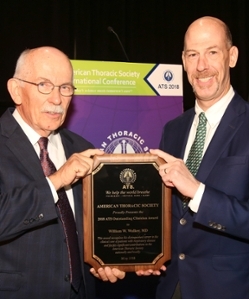 A member of the thoracic society chapter (TSC) for which they are being nominated as well as a resident of that state - to be considered for the TSC award. A member of the ATS - to be considered for the national level award. ATS members who wish to nominate an outstanding clinician should get the approval of the prospective nominee and then forward that individual’s name and CV to the administrator of the chapter in the state where the nominee resides. Click here for names of the ATS Thoracic Society Chapters. The ATS cannot accept direct nominations from individuals, and nominees can only be accepted from a state where there is a chapter. Deadlines: Submit nominees to your local chapter by Wed., Oct. 17, 2018. Completed applications for OCA nominees should be submitted by chapters to ATS by Mon., Dec. 10, 2018. Questions? Contact May Ling Brantman, Senior Manager, Member Services and Chapter Relations, at chapters@thoracic.org or (212) 315-8633. We look forward to receiving your nominations! from Marc Moss, MD (left), ATS President, May 2018.